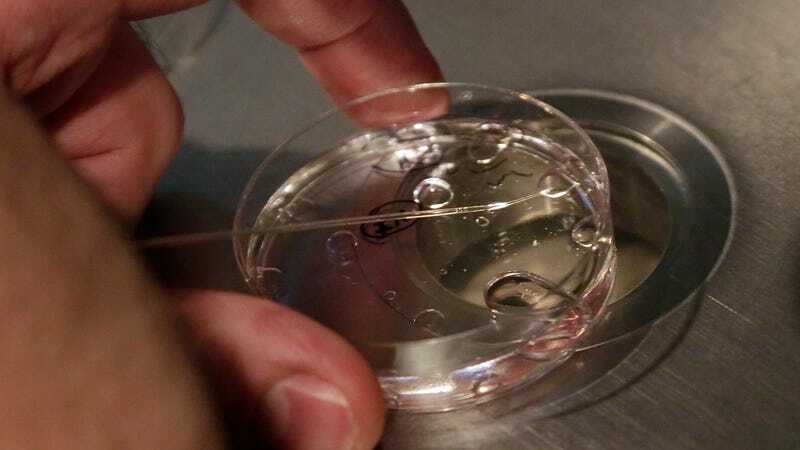 Human embryos in a petri dish. It’s become a familiar story in the age of consumer DNA testing: A person spits into a test tube to learn more about their genetic heritage, and ends up finding out they have a parent or sibling they didn’t know existed. It can be hard to keep family secrets under wraps when all it takes to reveal them is $99 and a mouthful of spit. One such DNA reveal is at the heart of a fascinating medical malpractice lawsuit filed last week in US District Court in Idaho. In July 2017, after sending in her own DNA sample to Ancestry DNA, Kelli Rowlette was surprised to receive a notification that her DNA seemed to suggest a parent-child relationship with a man she had never heard of that lived more than 500 miles away from her home in rural Benton County, Washington: a retired Idaho Falls obstetrician gynecologist named Gerald Mortimer. Unbeknownst to Rowlette, in 1979, her parents were having difficulty conceiving, and sought treatment from Mortimer. Mortimer suggested that part of the problem was Rowlette’s father had a low sperm count, and her mother a tipped uterus. He suggested a solution. They would mix Rowlette’s father’s sperm with just a small amount of an anonymous donor’s sperm to increase the chances of conception, and use this mixture for artificial insemination. The couple agreed, according to the lawsuit, as long as the donor met certain specifications: A college student who looked like Rowlette’s dad, with brown hair and blue eyes who stood over six-feet tall. Instead, the suit claims, Mortimer used his own. In 1981, Mortimer delivered to the couple a healthy baby girl, never divulging the possibility that she might be his own. Mortimer even remained Rowlette’s mothers OB/GYN, until a few years later they moved from Idaho to Washington State. Instead, a few months later, Rowlette was helping her dad clean out some old papers when she discovered her birth certificate stashed in an old roll-top desk. She noticed that the doctor who signed it was the same man whose name appeared as a parent match on Ancestry. She was horrified. Rowlette and her parents are suing Mortimer, his wife and Obstetrics and Gynecology Associates of Idaho Falls on claims of medical negligence, fraud, battery, negligent infliction of emotional distress and breach of contract. The family is seeking an undisclosed amount of more than $75,000 in damages. Mortimer could not be reached for comment. An attorney for the clinic noted that he had just received the case file but that none of the people who worked at the clinic in the 1970s and 1980s still work there today. The family’s attorney did not provide comment on the case beyond the suit.